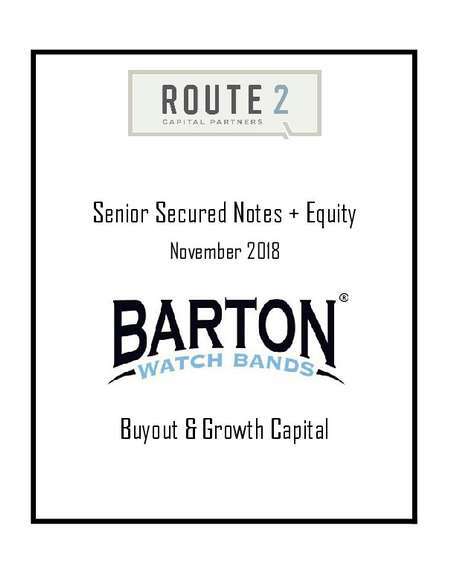 Route 2 Capital Partners (“R2CP”) is pleased to announce the financing of the buyout of Barton Watch Bands (“Barton” or the “Company”), an eCommerce consumer products company that manufactures and sells interchangeable watch bands for a wide range of traditional and smart watches. R2CP provided debt and equity to help facilitate the purchase of the Company from its current owner / CEO, Scott Herz, who will maintain a significant equity stake in Barton going forward. R2CP invested in Barton alongside private equity sponsor, Altacrest Capital. Headquartered in Austin, Texas, Barton is a market leader in the design, production, and sale of watch bands in a variety of styles, sizes, colors, and materials including canvas, leather, nylon and silicone. The Company sells products online via its own website, www.bartonwatchbands.com, and on Amazon’s Seller Central platform. Since its inception, Barton has demonstrated impressive growth across product lines and SKUs, while maintaining a focus on quality products and customer service. “Our long-term relationship with Route 2 Capital allowed us to efficiently close the transaction on a shortened timeline. We are excited to partner with R2CP and Scott Herz to enhance the growth of the Barton brand,” said Tim Laczkowski, Partner at Altacrest Capital.